Christmas Eve is a popular date night in Japan – the New Year holiday is coming, there are pretty lights everywhere, plus we all need some way to cheer up the shortest days of the year – so that’s when we booked our place at Akasaka Kikunoi. It’s traditional Japanese fare, in a traditional setting with tatami seating. You approach via a very subtly signposted walkway lined with bamboo and garden lights. We were sat in front of one of the kitchens, with the majority of our food prepared right in front of us and explained by the staff who brought it to us. (They had varying ability in English, but it was universally better than our dozen or so polite words in Japanese.) We had asked in advance for a set meal with no meat and were presented with our personalised menu on arrival. Although it was hushed and elegant and we didn’t know what to do a lot of the time, we were made to feel comfortable and had a wonderful time. 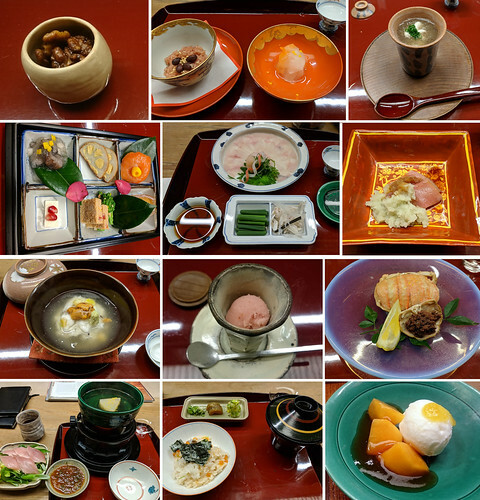 Here’s a collage of most of the food (if you click through to Flickr, the description details what each course was). It was all delicious. By the time we got to the rice and salmon roe (the 10th course out of 11) we barely managed a quarter of the food we were served. Thankfully, the desserts were small! The other meal we booked ahead of time was for my birthday, at Sushi Sora. This is based in the Mandarin Oriental hotel, on the 38th floor, and it’s tiny. There are counter seats for eight diners next to full-height windows looking out over the city. It’s a spectacular setting, made even more impressive while we were there by a super moon that we were able to see right from the point it appeared on the horizon. It was genuinely difficult to choose between looking at the view or at two of the world’s best sushi chefs performing their art right in front of us. This was in some ways the opposite of Kikunoi, in an ultramodern skyscraper, in a setting so fancy that we felt a little cowed (which is why we only have one photo between us from Sushi Sora; it felt wrong to take photos there). But the food was incredible – several courses of sushi and sashimi plus soup and dessert – with the added bonus of a happy birthday message on my dessert. But those weren’t the only great meals we had. Food in general was excellent – once we found it. It turns out that language isn’t the only barrier, but it’s a pretty major one when you’re trying to avoid meat. Sushi was easy, but everywhere else I had to be careful. Noodle broths are usually made from bone – and a lot of restaurants only sell bowls of noodles. Most restaurants are very small and specialised, so they tend not to have vegetarian alternatives on their short menus. Or maybe half of them do, but that’s not the half that offered English menus so we had no idea! We tried looking up recommendations on TripAdvisor and other sites, and that worked out maybe half of the time. Part of the problem was being overwhelmed by choice – the restaurants may be small but they are also very numerous. One thing that surprised us was the lack of breakfast options. Cafes offering breakfast or brunch seemed to be pretty scarce. This may have been the language barrier again, but it appeared to us that going out for breakfast or brunch was something only western tourists were doing. We did find a few places – and kept going back to them, despite some steep prices – but it seemed that the locals mostly picked something up from a corner shop or a French patisserie (there were a few of those around). We also could have eaten our way around the world pretty easily. 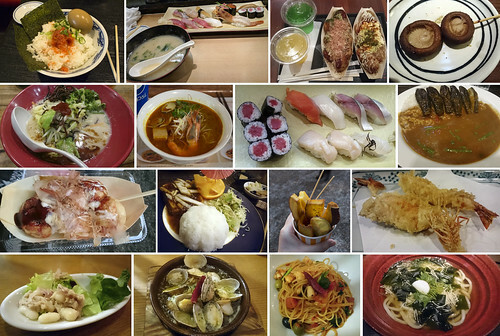 Tokyo is an enormous city and offers pretty much every cuisine you can think of. We had one Chinese meal (mediocre) and one Italian meal (very good) but we mostly wanted to find a variety of Japanese food. And we did! 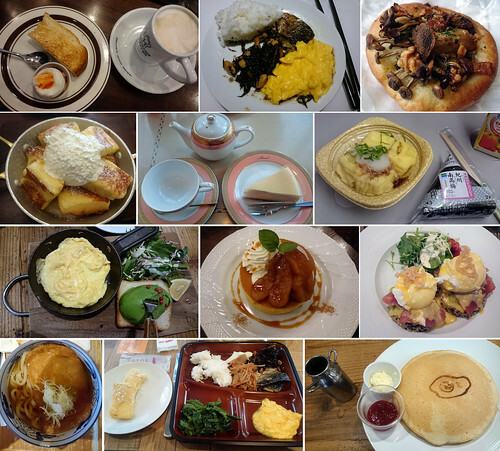 I feel like we should have done more research before the holiday to make finding food less stressful, but there were some wonderful meals that we had by just walking into a place and taking a chance. And serendipity can be a wonderful thing. Oh my good it looks so delicious! !